The silos, freshly cleaned and ready for paint, behind the art deco offices of Transport Waimate, Queen Street. 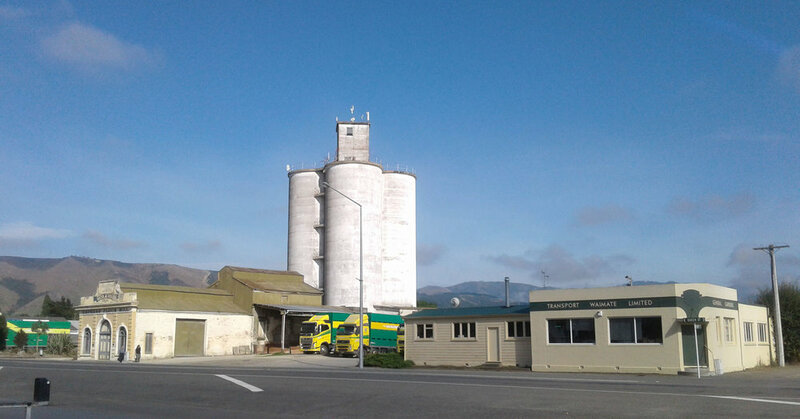 Waimate will be home to one of New Zealand’s largest pieces of street art, with confirmation that local artist Bill Scott is to paint the town’s landmark grain silos.  The project is being sponsored by Transport Waimate Ltd, which owns the silos. 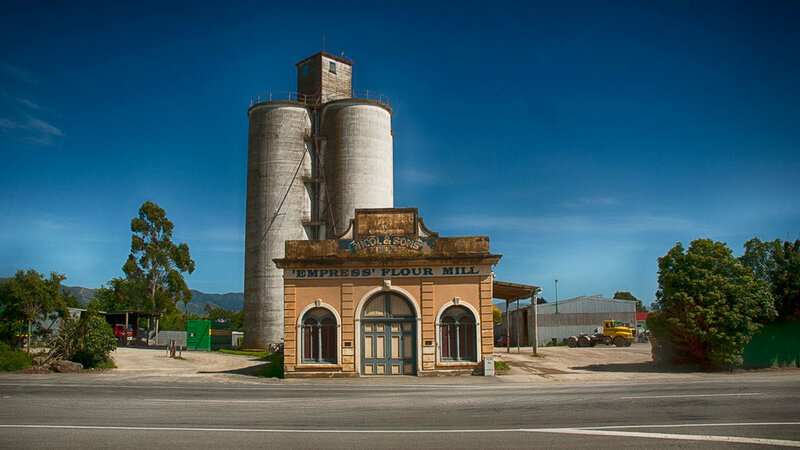 The company has commissioned Bill Scott to paint the four silos, which were opened in 1921. Transport Waimate director Barry Sadler said Resene Paint was donating the paint for the artwork. Grain silos art is popular in Australia, and contributes to growing tourism in small communities similar to Waimate District, he said. Asked about what’s planned to be painted on the silos, he said that was under wraps for now. The silos are 35m high, and were the first of their kind in New Zealand. Transport Waimate Ltd, established in 1946, is one of the longest-running businesses in Waimate district. 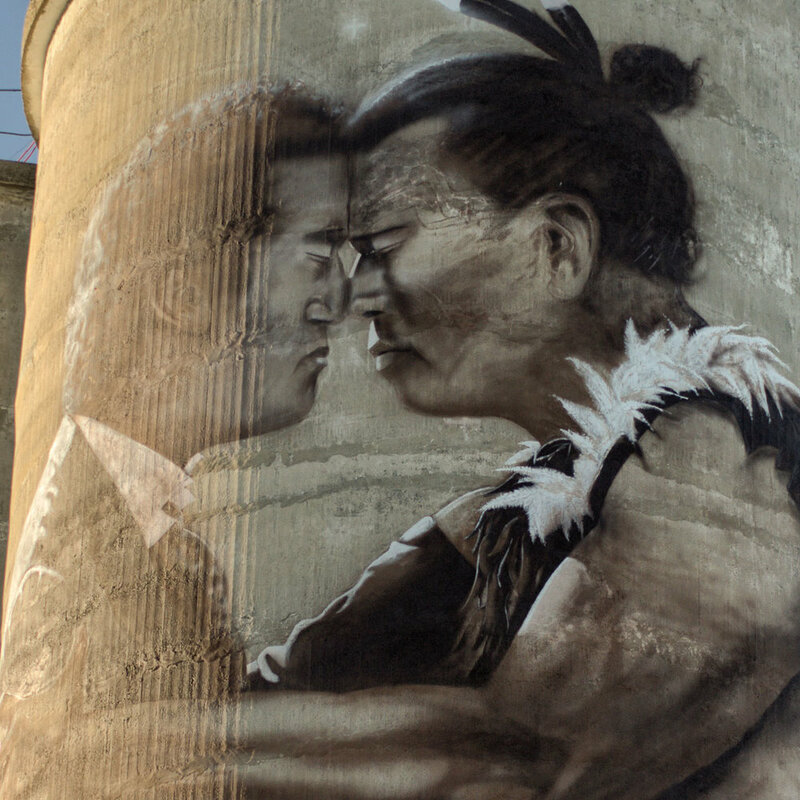 Waimate residents can look forward to seeing one of the largest pieces of street art in New Zealand when the town’s historic grain silos are painted. 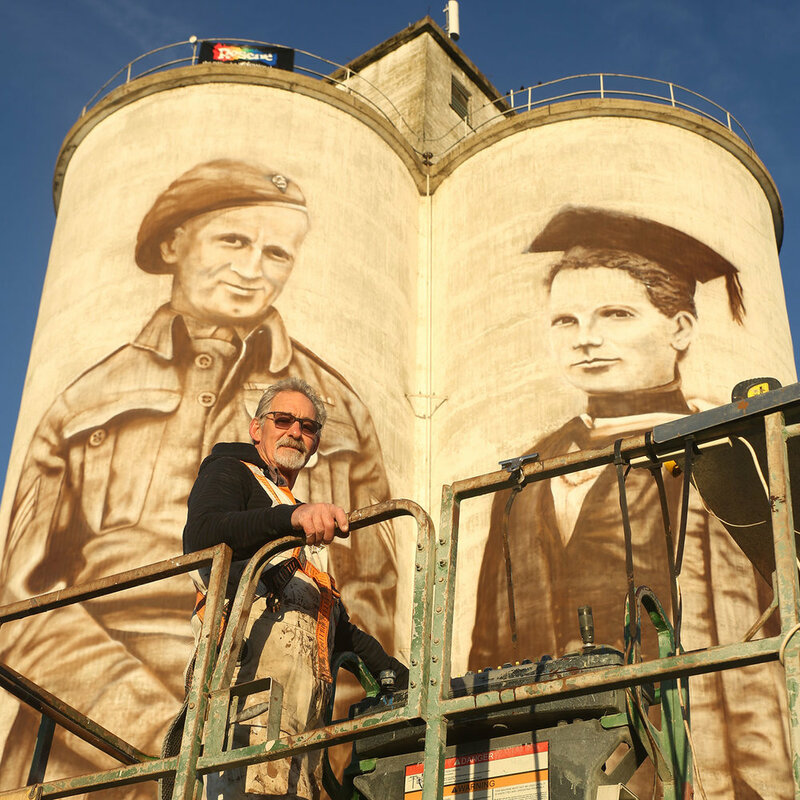 Artist Bill Scott sees painting the town's silos as an opportunity to celebrate more of the South Canterbury town of Waimate's history. Scott has painted four or five murals around the town which were all about "celebrating what we do here". The concrete grain silos at Transport Waimate's Queen St yard have been getting a lot of attention lately. Since 1934, the four hand-built 30m-tall silos have towered over the town of about 2700, but heads have turned this week as work begins to transform each one into a large-scale mural. A massive mural project is well on the way to becoming a major tourist attraction in Waimate. The project is the brainchild of Transport Waimate boss Barry Sadler, who has enlisted the help of Waimate artist Bill Scott. The four silos will eventually be adorned with giant murals that give historic perspective to the area. 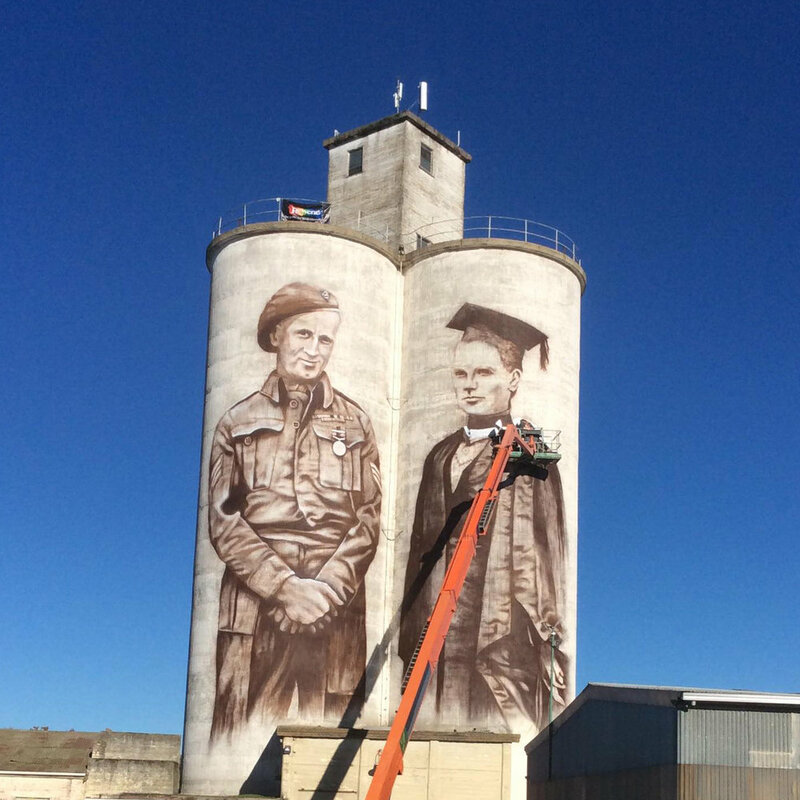 Waimate's massive mural project has a new addition and it's timely as the nation observes Anzac Day. Waimate's World War II hero Eric Batchelor has been immortalised alongside other legends of the district, Chief Te Huruhuru, Michael Studholme and former Prime Minister Norman Kirk as the project nears completion. Waimate's massive mural project is nearing completion with another legend immortalised. Margaret Cruickshank joins World War II hero Eric Batchelor, Chief Te Huruhuru, Michael Studholme and former Prime Minister Norman Kirk on the silos. Bill Scott's towering homage to the history of his South Canterbury home town is complete. 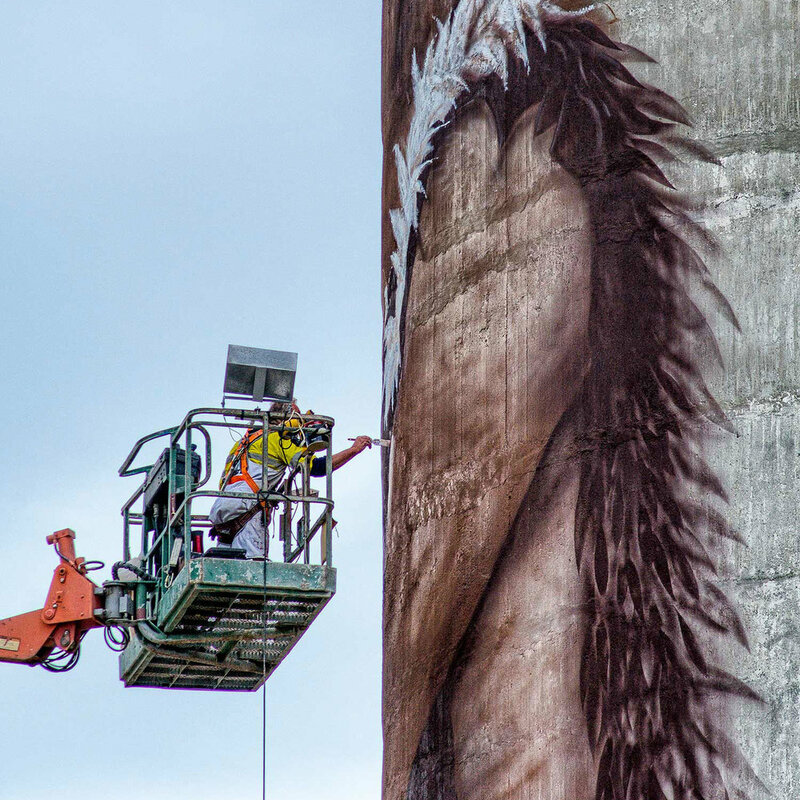 The Waimate painter put a few finishing touches on the final panel of his four-part monochromatic sepia-toned mural on the 1934 concrete grain silos at Transport Waimate's Queen St yard on Monday.